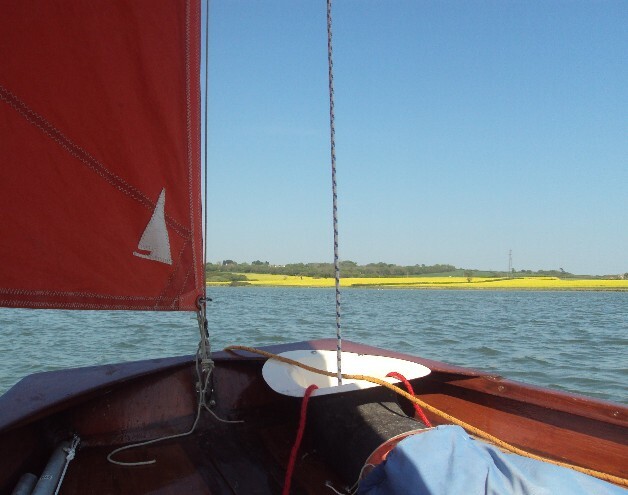 It was perfect weather over the Easter holidays to be back sailing our little flotilla of boats. First we rigged up our Mirror dinghy and had a leisurely sail around the River Medina with a light Easterly breeze blowing. A hot sunny day developed and we sailed her over to our yacht and went aboard to have a coffee and sunbathe. 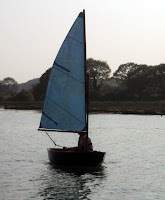 Another day we went out with our little Pup dinghy "Peewit". 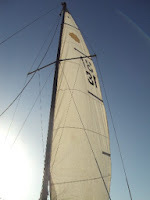 She is a Tender to our yacht as well as ideal for solo sailing just for fun. 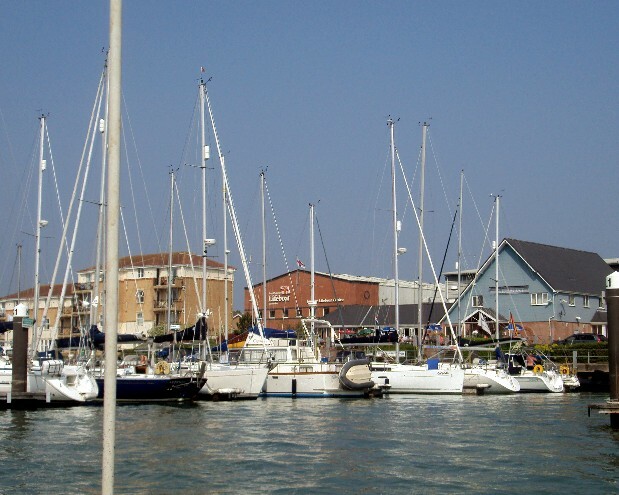 We motored down the river to East Cowes Marina in our yacht and as the wind was a Northerly we raised the jib and were able to sail back up river. 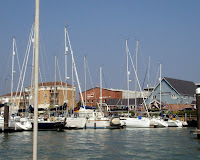 The Marina was lively with visiting craft, the river sparkled, the Sun warmed us against the Northerly breeze; it is just wonderful to be back on board. Having just arrived on board our yacht, we were off loading our gear from Peewit when Skipper noticed a small dinghy had broken free from her mooring and was drifting swiftly up the river. Not a good sight to see as it is always a worry that someone may have fallen out of it, we knew this wasn't the case in this instance. 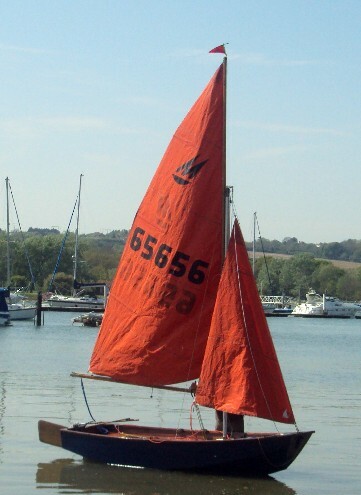 However loose boats can do damage to other craft as they hit and scrape by. where with help of a fellow boatman they made it secure. 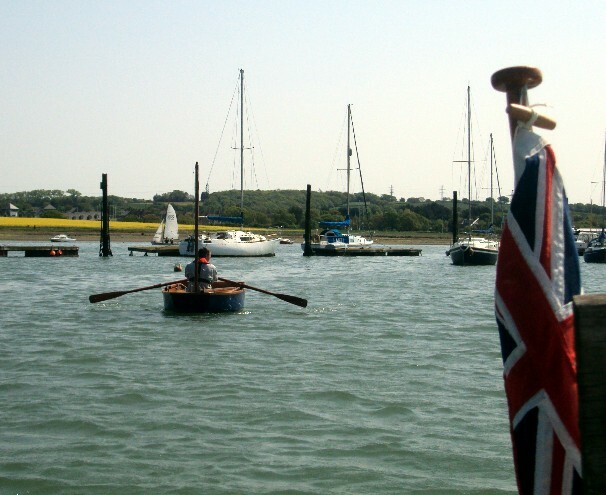 Then off down river they rowed wind and tide against them to a little day boat where the occupancies on board were unaware that their little dinghy had decided to go on a solo voyage! Peewit collected the owner and Skipper rowed them to the pontoon to retrieve their lost boat. I'm sure he will be using a few more knots when tying on from now on! Skipper has earned himself a beer with all that rowing. And Peewit just loves being on the water, rowing, sailing and being helpful. "Lift in" day for our Sunstar 18. It has been a bit of a mad panic getting ready for Saturday morning as it became apparent that our old outboard's gearbox has packed up leaving us without an engine! Fortunately a few phone calls around to local chandlers and outboard suppliers I was able to source this fantastic "nearly new "Mercury 4 stroke outboard from Cowes. Skipper fitted it in place with a few hours to spare! 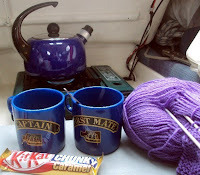 Had a morning coffee and did some knitting while we waited for our turn to be lowered in by crane. It was a warm cloudy morning with no wind, quite muggy at first with a light Easterly later in the day. The Sun was shining by mid day, so I was pleased to be on board this trip. As there was no wind we motored down river to our swing mooring and we practised a few manoeuvres with the new outboard, it is lovely and quiet, nice and nippy too. The only concern is that it is heavier than our old one and with the full tanks of fuel and water she seems a bit low in the water aft. 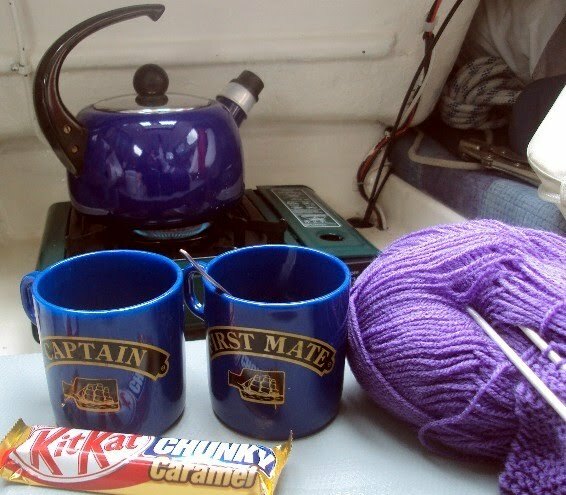 So for now I have re-arranged stuff from the aft locker into other lockers thus taking a bit of weight out. 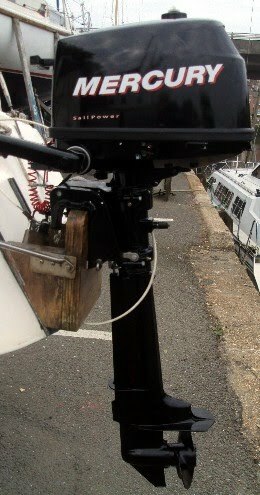 We may want to raise the outboard bracket, we'll see how things go after a proper trip out in the Solent. 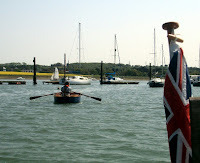 We took the Folly Launch taxi to shore and had lunch at the Folly Inn. Then walked along the riverside foot path back to Newport to collect the car and home. It's good to be back on the water and with the Easter and Bank holiday days just around the corner we are hoping to get out there and enjoy it! What a lovely sunny April Weekend. It was Skipper's Birthday and our Wedding Anniversary so we had a houseful of family over and spent a wonderful time celebrating in the island sunshine. 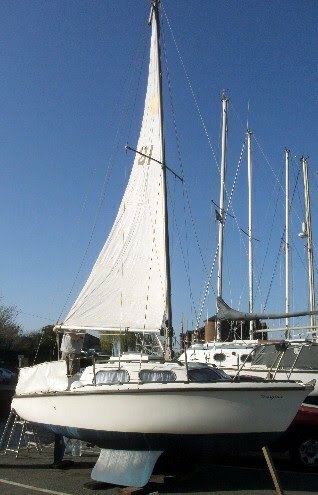 Last week preparations now, plenty of jobs to do to get our little yacht ready for her "Lift in day" next weekend. 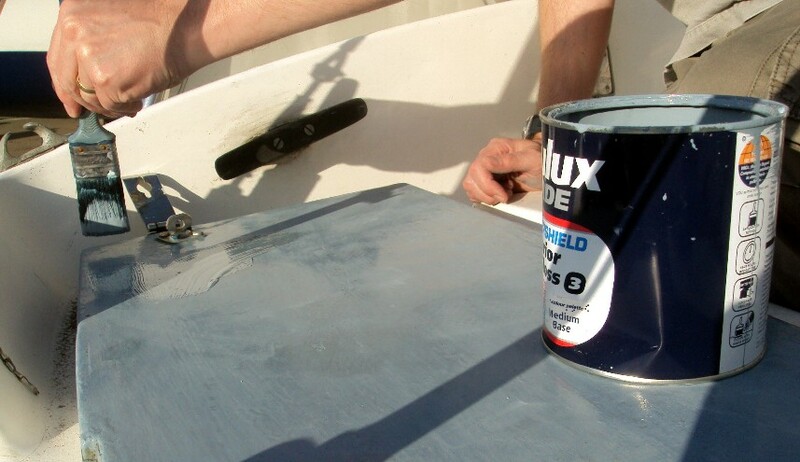 A major concern is the outboard engine which is in the repair shop having a new part fitted. I hope the good weather holds! 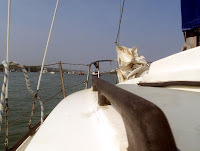 I hope for a light southerly breeze in warm sunshine as then we can shake out the genoa and sail our way down to our swing mooring. Looking up in my logbook the last couple of year's it has been a strong cold northerly blowing and Skipper and son have donned their woolly hats and coats to motor her down to the mooring, while I have stood at the river edge taking photos and met them afterwards in the Folly Inn for a warming hot lunch! Rigging her out again and putting the mainsail back on the boom. 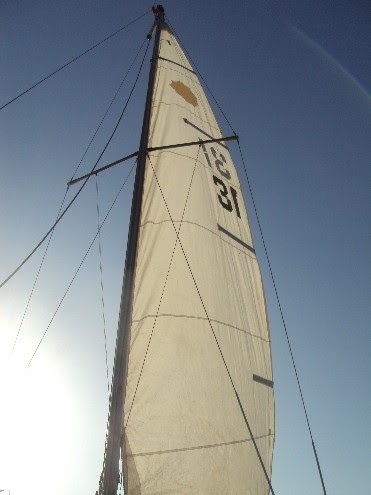 In the calm conditions we were able to raise the sail to check for smooth running, giving me an interesting photo opportunity. Firstly because I'm usually on board so I only get to see the sails from that perspective and secondly seeing the hull and twin keels while the sail is up gives a great view of all her lines. Thank you to everyone who has taken the time to comment on various posts. It always lovely to read your comments so a big thank you to all!